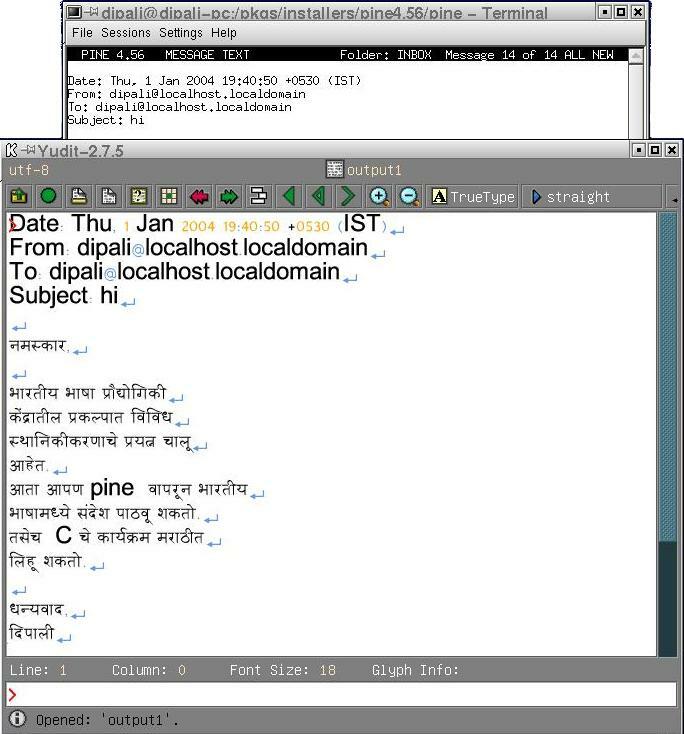 This system allows for reading and writing mails in Indian languages using Pine as message handling tool. Pine is University of Washington's Program for Internet News and Email. It is mainly used for English correspondence. 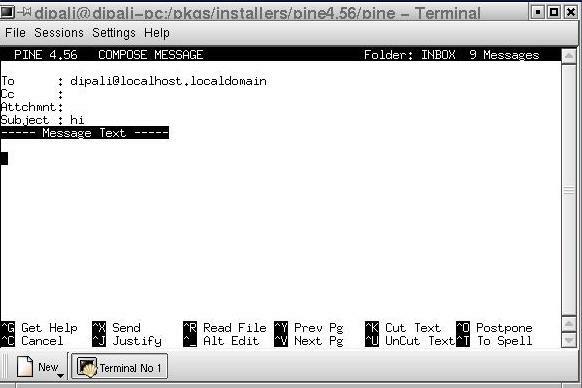 The default character-set for Pine is US_ASCII. 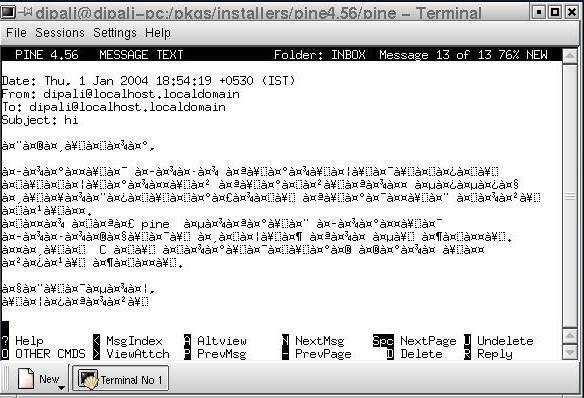 Pine can be used for reading and writing mails in non-ASCII characters by setting appropriate character-set variable. But pine doesn't recognise Indian language characters. 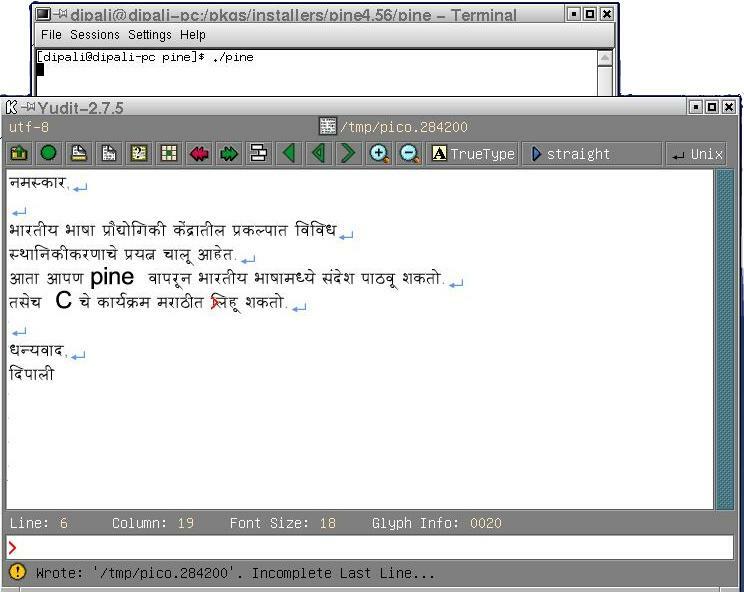 Indian language support for Pine is provided using alternate editor and alternate viewer. Pine has built-in support for alternate editor. Similarly alternate viewer option is implemented in Pine. Yudit, unicode editor is used as alternate editor and viewer. Yudit is Unicode editor, developed by Gáspár Sinai. This allows reading and writing mails in Unicode encoding as well as ISCII encoding. For reading and writing mails in Indian Languages follow the below steps. Now you can read and write mails in Indian languages. When	you enter in the Message Text area, press ^_ (control key and underscore) for alternate editor. Yudit window will open. Select the language in which you want to write a mail, write messege and save it. exit the yudit. The messege will appear in the Message Text area. ^x for sending the messegge. Enter key for FLODER LIST. select the messege you want to view. press 'a' (AltView) for alternate viewer. yudit window, containing the message will open. After reading the message close the window.